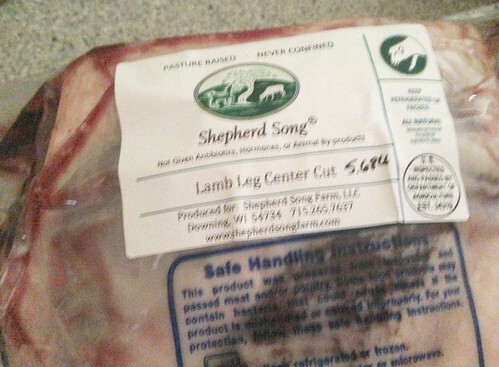 For this meal, I partnered with Shepherd Song Farm who raise 100% grass-fed lamb and goat meat. They do not use pesticides on their land and use NO grain, animal byproducts, antibiotics or hormones. Their lambs and goats grow naturally on Wisconsin meadows. The cool northern summers of the upper Midwest result in outstanding pastures that produce premium, lean lamb and goat in a healthy environment. They live in the open air and sunshine and their livestock are not confined to stalls, on concrete or in feedlots. Quality of life for their animals is one of their main values. When you buy from Shepherd Song Farm you support environmentally friendly, sustainable agriculture, healthy, relaxed animals and the rapidly disappearing family farm. The flavor of Shepherd Song lamb is delicious and so tender - this was probably the best lamb I've ever had. My brother and I prepared this lamb and we were both impressed with the quality. I don't cook lamb very often but after having Shepherd Song lamb, you may find me preparing lamb more often! The recipe is simple and perfect for impressing guests without much effort. The key is the use of fresh herbs as opposed to dried. I like how the fresh herbs really added flavor and the natural juices of the lamb added to the bed of potatoes and onions. Preheat oven to 400°F. Generously butter large roasting pan. 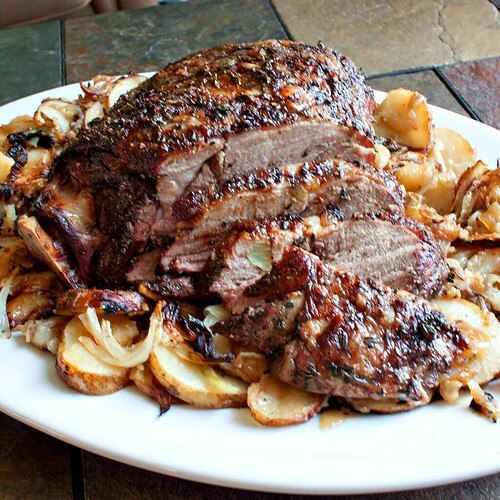 Using small sharp knife, cut 1-inch-deep, 1/2-inch-long slits all over lamb and insert garlic slices into slits. Rub oil all over lamb. In a small bowl, combine the thyme, savory, rosemary, salt and pepper; rub herb mixture all over lamb. and set aside. Combine potatoes and onions in a large pot. Add beef stock (or broth) and set over medium high heat (stock will not cover vegetables). Bring to boil then reduce heat, cover and simmer until potatoes are halfway tender, about 10 minutes. Transfer potato mixture to prepared buttered roasting pan; spread evenly in pan. Sprinkle with salt and pepper. Bake 10 minutes and remove from oveb. Reduce oven temperature to 375°F. Place lamb in roasting pan on top of the potato mixture. Transfer pan back into the oven and roast uncovered for about 1 hour and 45-50 minutes or until thermometer inserted into thickest part of lamb registers 130°F. for medium-rare. Remove from oven and tent with foil and let stand 15 minutes. Thinly slice lamb. 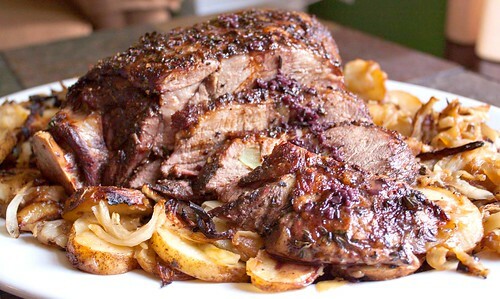 Arrange lamb on large platter, surrounded with potato mixture and any juices from pan and serve. Roasted Lamb makes me so happy! Mmm, I bet the potatoes are delicious with all the lamb cooking juices cooking into them! I LOVE leg of lamb. I haven't had it in forever and now I have a major craving! I've never made a lamb for the family. The pictures look like it'd be a dish that's a hit though. I'll run it by hubby when he gets up (napping) and see what he thinks. :) Thanks for sharing! Wow, that looks amazing! 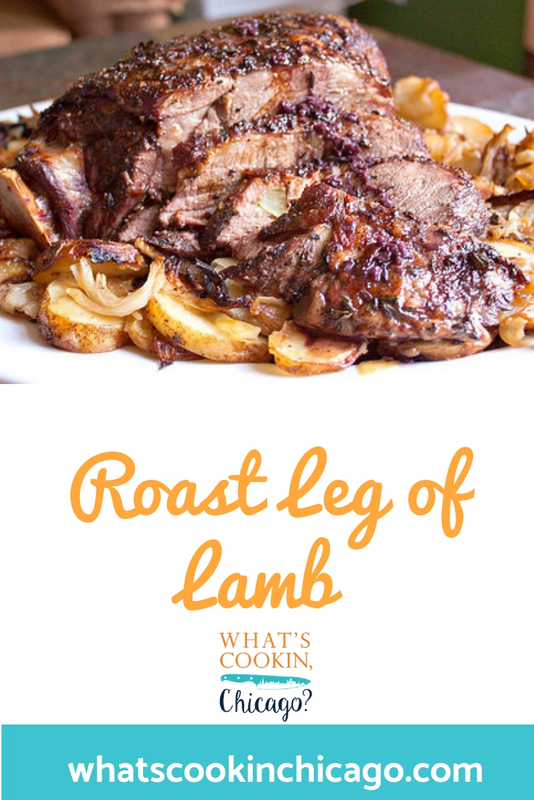 So fresh and juicy, this would be perfect for our Easter dinner. I've not heard of them before, I'll surely be checking them out, thanks for sharing! What a beautiful and tender roasted leg of lamb. It just looks incredible and would be fabulous any time!